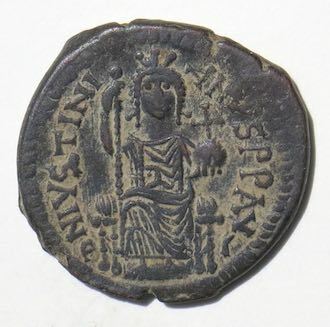 under the Byzantine emperor Justinian, 527-565 AD. 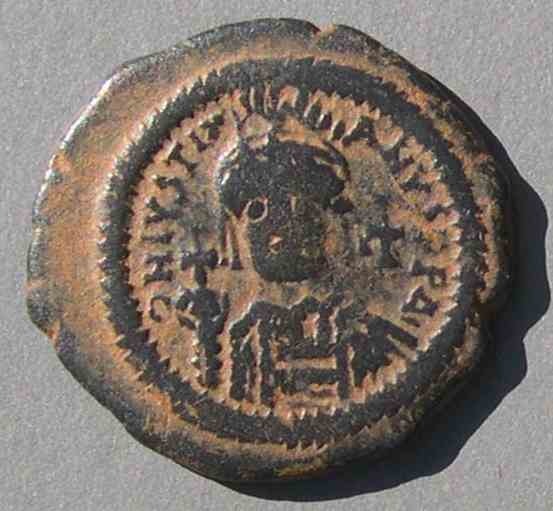 The variety of mintmarks for Antioch under Justinian is remarkable. There are at least a dozen very different mintmarks. What's new? 2019, Jan 7: An example of the mintmark used in years 20-24. 2018, Dec. 19: An example of the year 16 mintmark (Sear 219) which only lasted that one year. 2018, June 29: New illustrated list of mintmarks (right after the first coin). 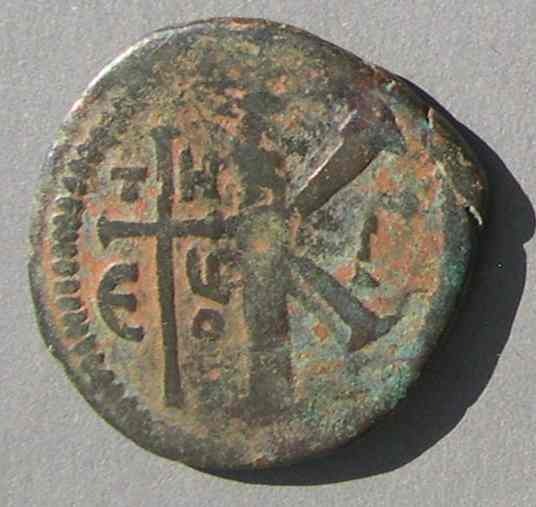 Each mintmark image can be clicked to go to the whole coin in the text below. Also, the font size was increased throughout. 2018, May 2: An example of the "+THEUP+" mintmark, Sear 216. 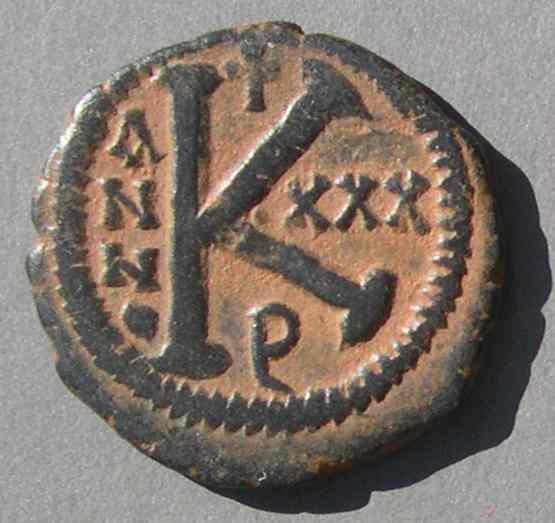 The first mintmark under Justinian was ANTIX, which resembles our spelling, Antioch, but with "X" (a Greek chi, for the "ch" sound) at the end because it is really in Greek (and the "O" is arbitrarily omitted). 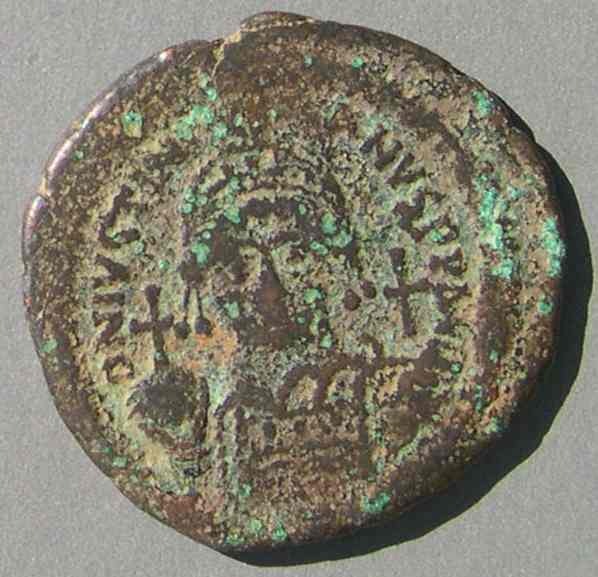 Only the first year of Justinian's long reign continued the ANTIX mintmark commonly seen under Justin I. 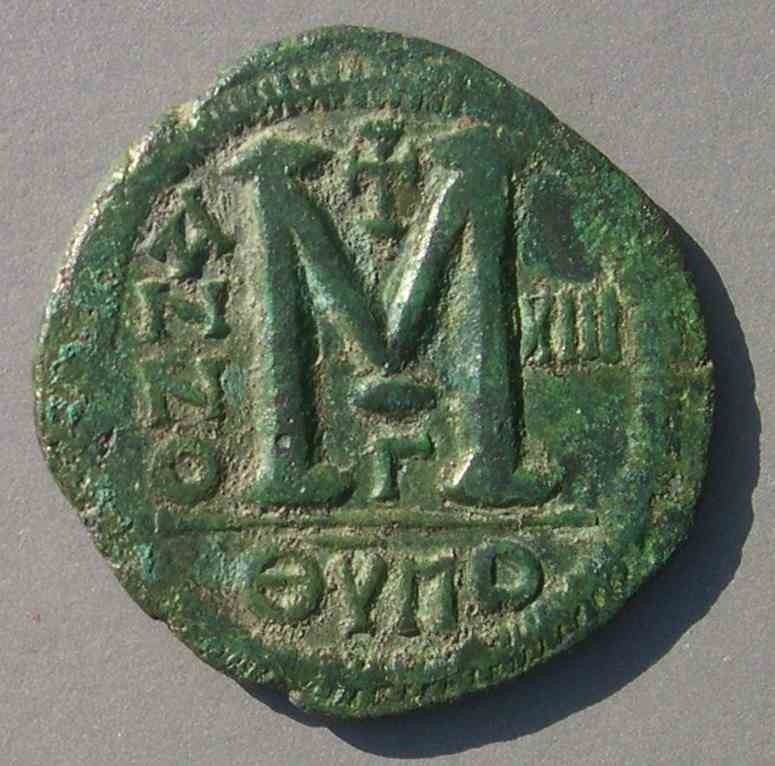 The Great Variety of Mintmarks for One City: The mintmarks are listed and illustrated next. 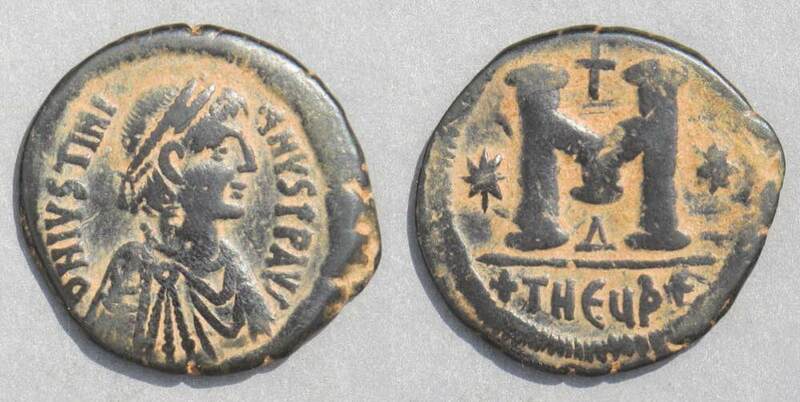 They are discussed and their coins illustrated following the tragic story of Antioch. 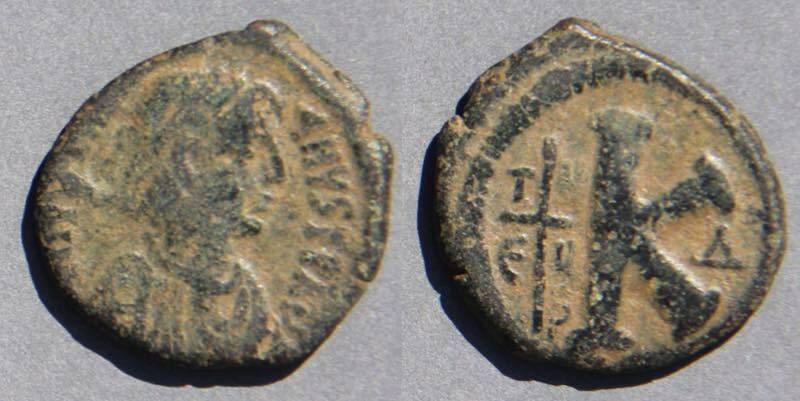 Antioch was renamed "Theopolis" after the first year of Justinian's reign, so some mintmarks refer to Antioch and others to Theopolis. 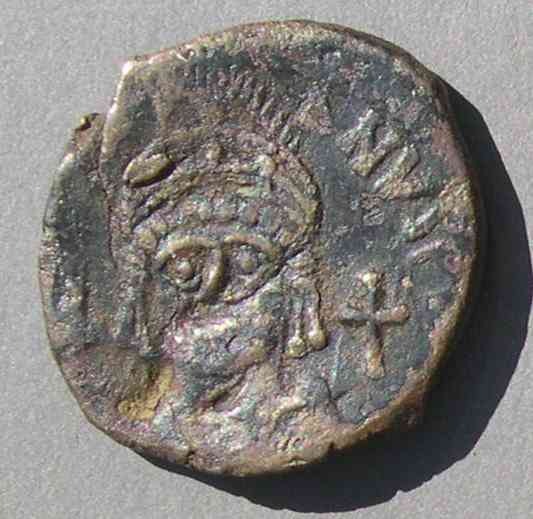 The mintmark changed when Justinian's coin reform introduced the facing bust in year 13 at Antioch (The reform began in year 12 at Constantinople). If you want to skip the tragic story and just see illustrations of the coins, click here. The Tragic Story of Antioch. 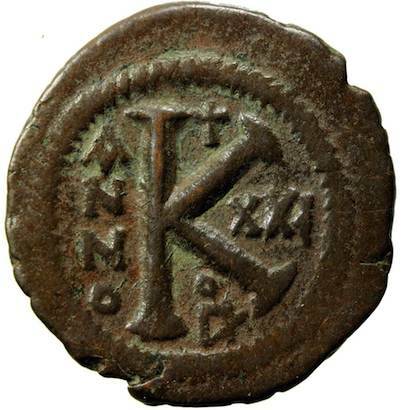 Antioch was primarily a Greek-speaking city and the "X" of "ANTIX" is a Greek chi, which gives the "CH" sound in Antioch. 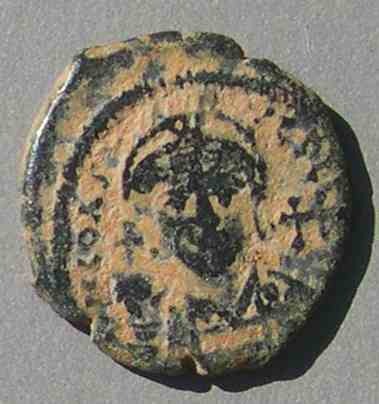 But the mintmark ANTIX is rare under Justinian (but not rare earlier) and did not last long. The city had been the capital of Syria and one of the three major eastern cities of the empire (Constantinople, Antioch, and Alexandria), but on May 29 of 526 (about a year before the reign of Justinian began) an extremely violent earthquake hit which destroyed most of the buildings and the subsequent fire destroyed most of the rest. Reportedly 250,000 people died. Antioch never really recovered, nor did the disasters cease. 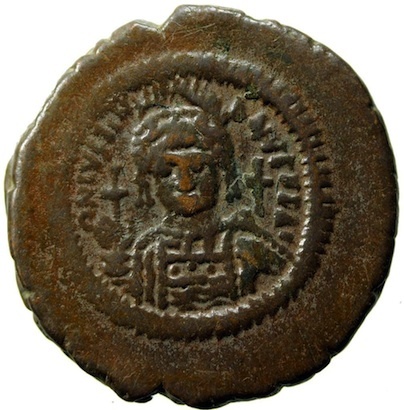 On November 29 of 528, about two years later and a year after Justinian's reign began August 1, 527, Antioch was again hit by a powerful earthquake which killed another 5,000 of the already-reduced population. After this the remaining hopeful and fearful population renamed it "Theopolis" (less frequently spelled "Theoupolis"), the "City of God." 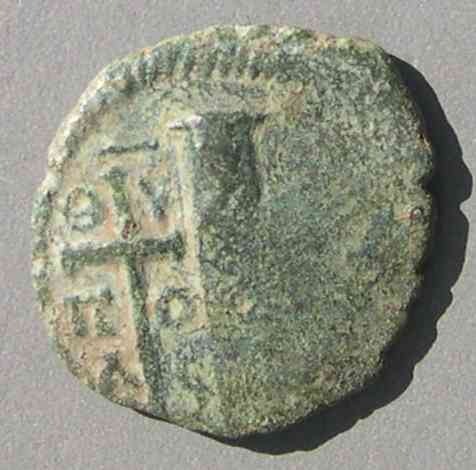 Thereafter, coin mintmarks referenced the new name. Only a dozen years later, in 540, the Sasanian emperor Khusru I (Chosroes) sacked the somewhat restored city, burned all but the suburbs, and took captive those he did not manage to kill, eventually using the captives to populate a city, "Antioch of Khusru," which he founded on the Tigris a day's distance from Ctesiphon. Only a year later, in 541, Antioch, and much of the rest of the empire, was hit by a devastating plague which was so severe that at its height it killed thousands a day in Constantinople and which returned three more times in that generation. 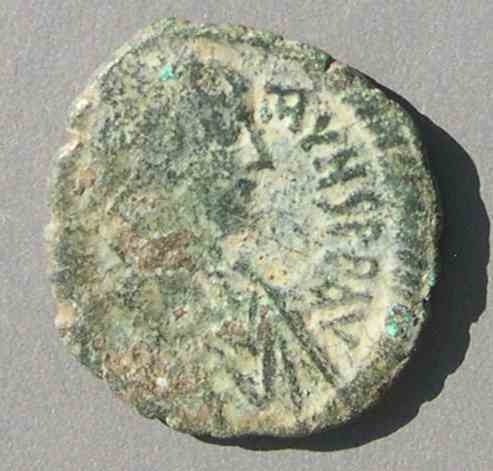 Not only was Antioch again devastated, but so was the whole empire. 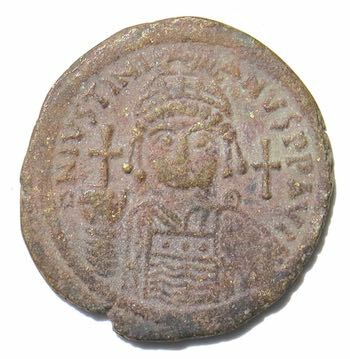 The history of Byzantine Antioch (Theopolis) ends in the next century in 637 when it was conquered by the Arabs. 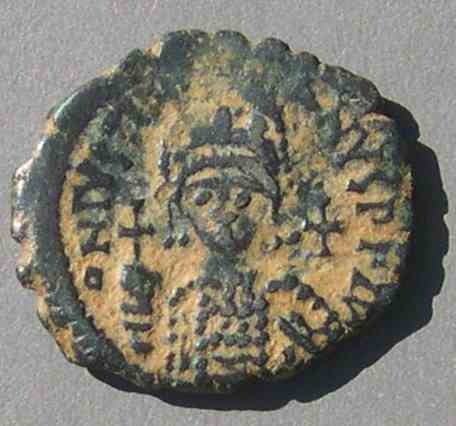 Justinian became emperor August 1, 527, about a year after the first earthquake and a year before the second. 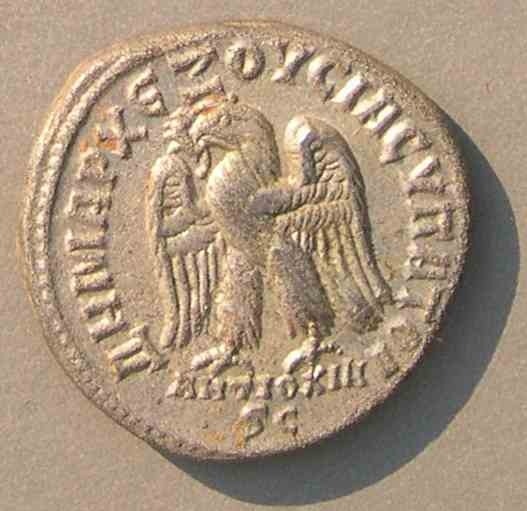 So, for about one year of his reign the coins had an "Antioch" mintmark and for the remaining 37 years the mintmarks abbreviated "Theopolis." 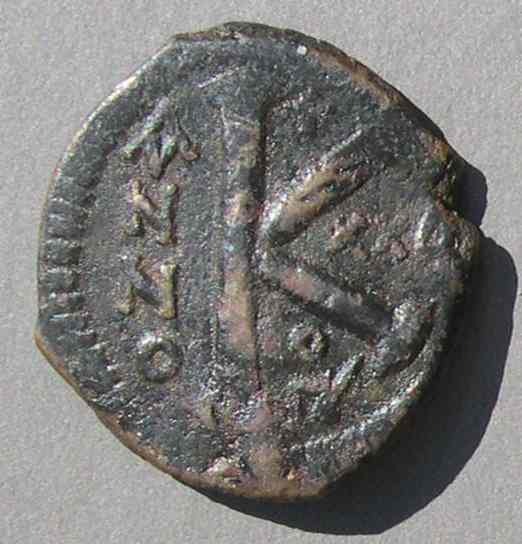 Coins While the City was Still Named "Antioch". 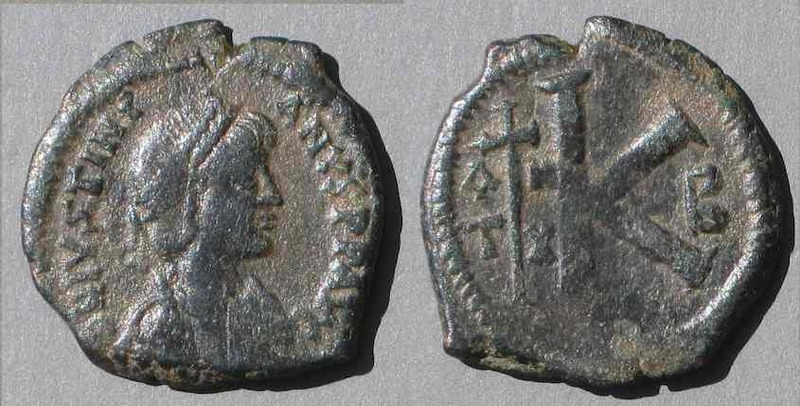 The half-follis (20-nummia) coins had the city name spelled on either side of a long cross. 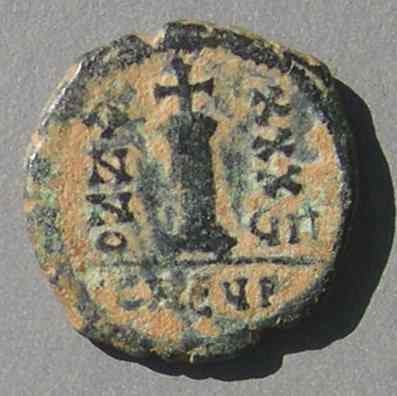 The style of this piece is as good as most Byzantine coins of the period. It is from before the second earthquake. BMC --, MIBE (Hahn) 132B. DO --. MIBE 133 clearly has TI-X where this one has T-X. The DO example is poor with the supposed "I" invisible and may actually be this type. The quality of the obverse lettering is not as good as on the previous coin. Struck before the second earthquake of 528. 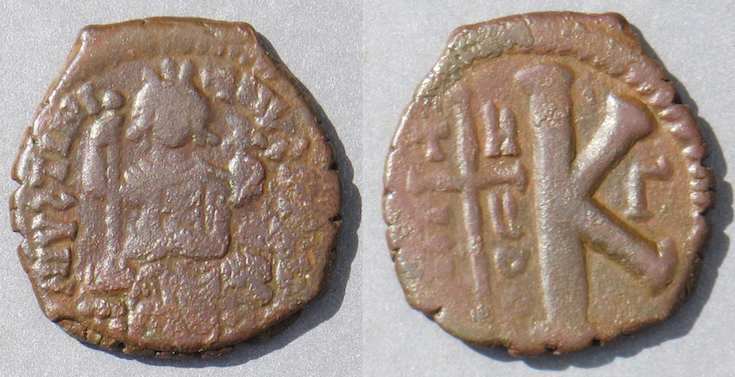 MIBE (Hahn) 132, this coin. The next two are irregular, blundered, full-sized folles intended to be like the first coin on this page. 40-nummia, 35 mm. (remarkably large -- at is broadest 5 mm larger than official coins), 14.99 grams, (full weight for the type) 6:00 die axis. The large size and full weight suggest this was made to supply a need for coinage, as opposed to illegal production for profit. Another imitation of Sear 213, however with a cresent right. 40-nummia, 35-30 mm. (remarkably large) 15.30 grams, (full weight for the type) 5:30 die axis. 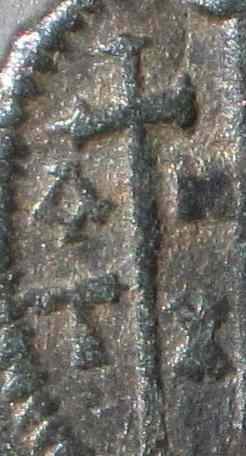 This and the previous blundered coin suggest that the demand for coin dies could not be supplied by literate engravers at the mint. 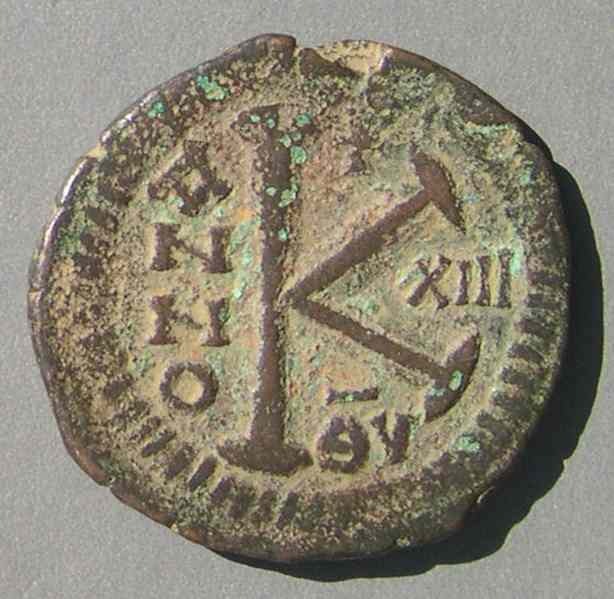 Maybe they were killed in or displaced by the first earthquake, although there are some coins of this type and the next that are of good style and spelled correctly (above). However, the heavy weights of these two do not suggest an attempt to profit by issuing lighter coins. I don't see how we can know, but I think these are official mint products from Antioch at a time of extreme stress. Bates suggests the mal-formed letters might have been intentional as retaliation for Justinian's persecution of paganism and heresies at Antioch [p. 74]. 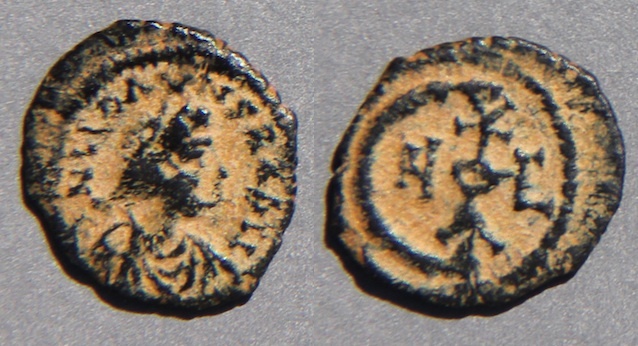 There are 10-nummia pieces, but no 5- or 1- nummia pieces, with a variant of "Antioch" for a mintmark. After the Second Earthquake. After the second earthquake Antioch was renamed "Theopolis"-- THEOUPOLIS. Mintmarks exhibit the new name. At first the profile bust is retained. which began the facing bust series [below] at Antioch). 31-30 mm. 11.68 grams. 6:00. The reverse is odd for having a bent "M". but the mintmark is clear and well-struck only once. because there is little beauty or perfection to be seen. Another Sear 216, this one an imitation. 30-28 mm. 11.97 gra,s. 6:00. 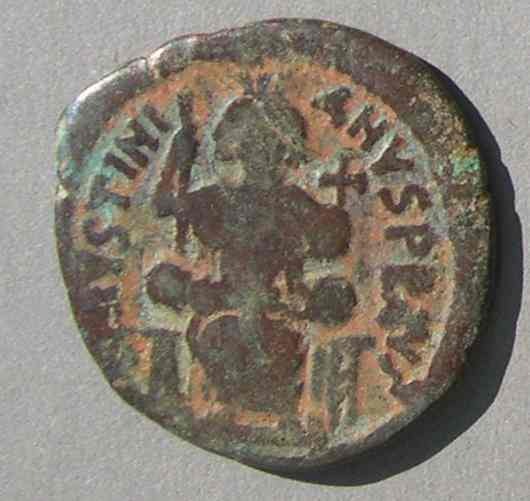 The previous coin with the bent M nevertheless has obverse lettering that looks official. The reverse is also crude, with the middle of the M oddly expended downward. 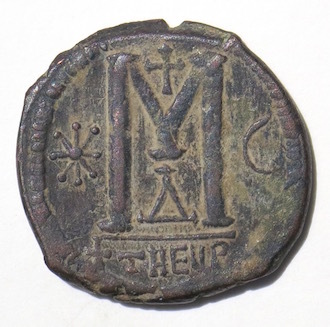 +THEUP+ with a small "o" above the P.
After two earthquakes the mint was having trouble. This example has the 6:00 die axis of official pieces, but does not look official. Is it a local imitation to provide coins that the mint did not, or is it an incompetent attempt to make an official coin by a stressed mint? 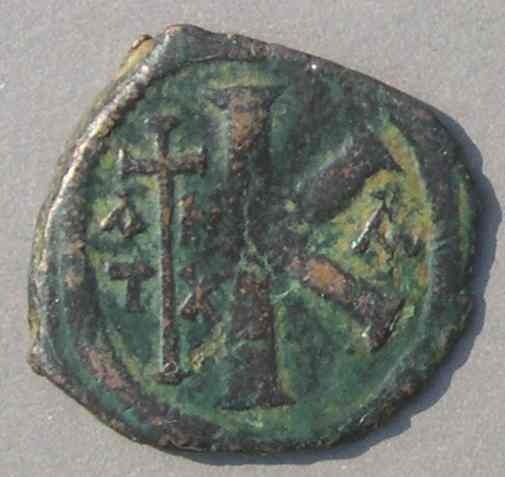 After the name change the half-follis has "TH EU O P" instead of "AN TX" across the cross. Here is another pre-reform type of the 40-nummia denomination. 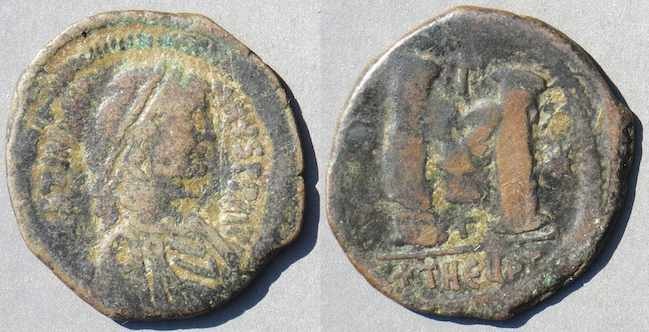 A new (and unique to Antioch) "enthroned facing" bust retains a Latin minkmark. 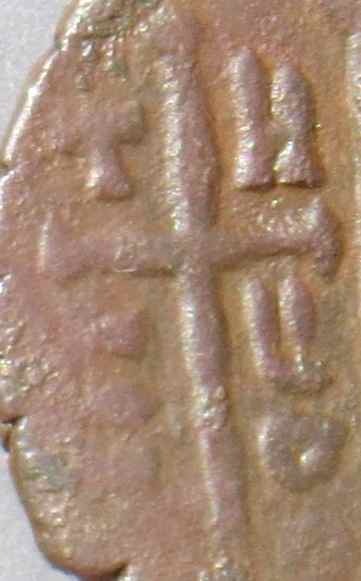 This "enthroned facing" type appears also on the 20-nummia (half-follis) denomination with the city name across the cross. 24-23 mm. 9.04 grams. 12:00. 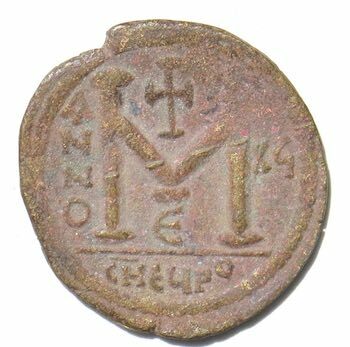 In Greek (and Antioch was a Greek-speaking city), Theopolis is spelled θEOYΠOΛIS, which is variously abbreviated on coins. In 536/7 the profile bust returned when the spelling switched to Greek. which is distinguished by facing busts. 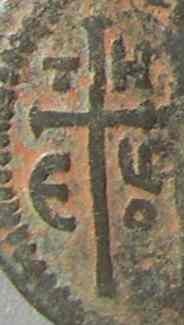 The 20-nummia piece has its mintmark in Greek: θYΠOΛS is spelled across the cross, instead of the previous "AN TX" and "TH EU O P" Latin types. The Facing-Bust Coin Reform. 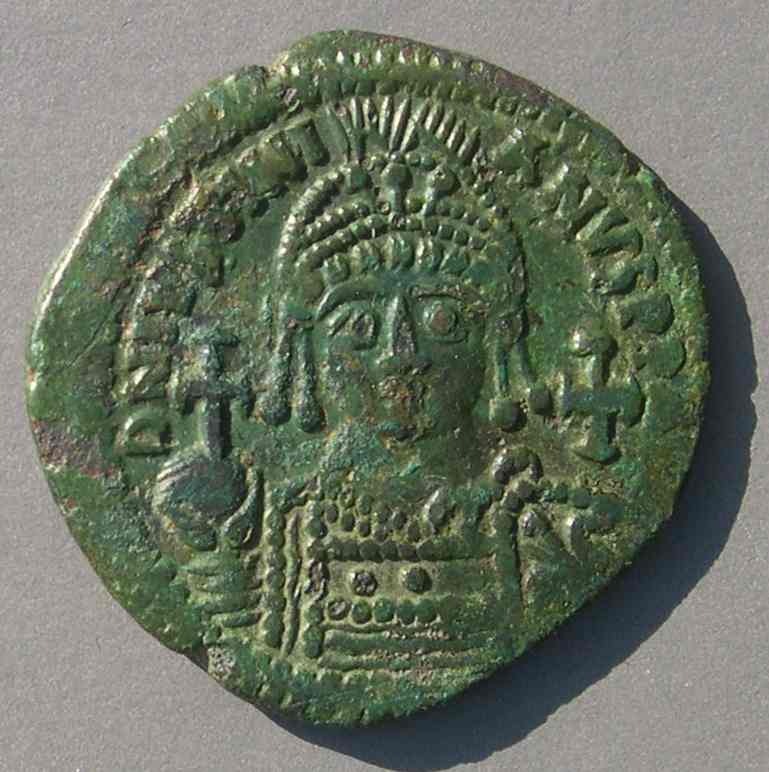 The copper coins were reformed in year 12 (538/9). They were made larger and the profile bust was replaced with a facing bust. The new city name, "Theopolis" is abbreviated or spelled out in Greek (Antioch was primarily a Greek-speaking city) on the first folles. 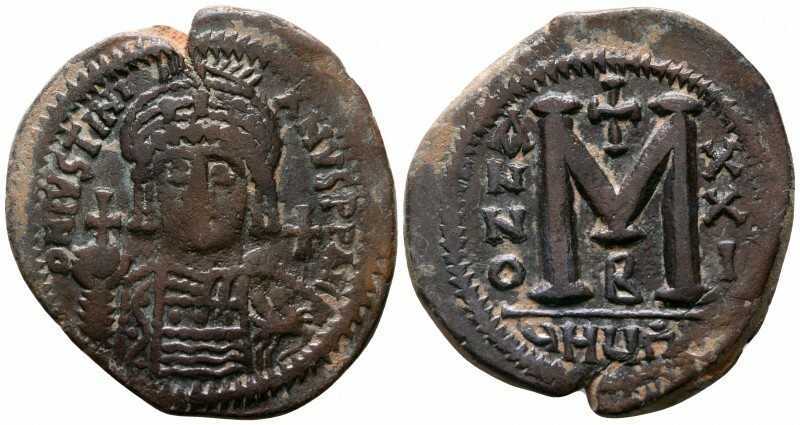 After this reform the coins were explicitly dated by regnal year. [Only year 13.] "θVΠO" is close to spelling out Theoupolis. on a large follis of year 13. 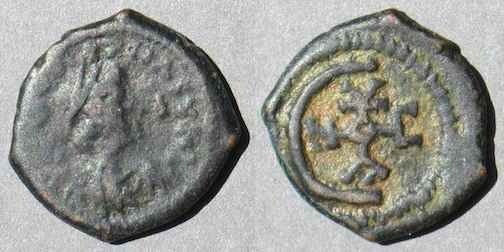 The reform which yielded this new, larger, coin started in year 12 at Constantinople but did not begin at Antioch until year 13 and no coins of Antioch were issued in years 14 or 15 (probably due to the invasion of Khusru mentioned above). 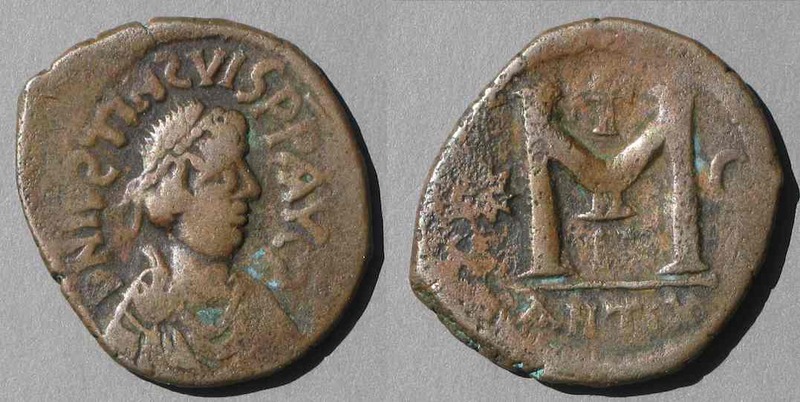 The mintmark switched to Latin in year 16 (see the next coin). 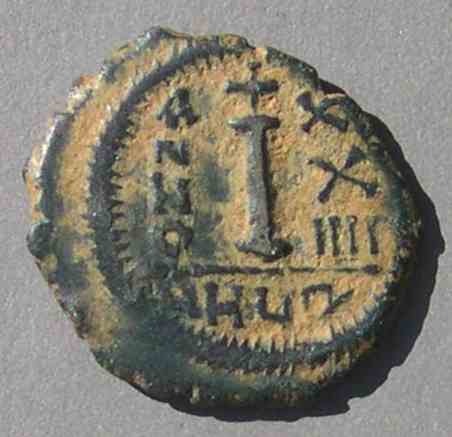 (There were no coins at Antioch in years 17, 18, or 19 either). So, this short-version mintmark was used only in year 13 making this a one-year type. 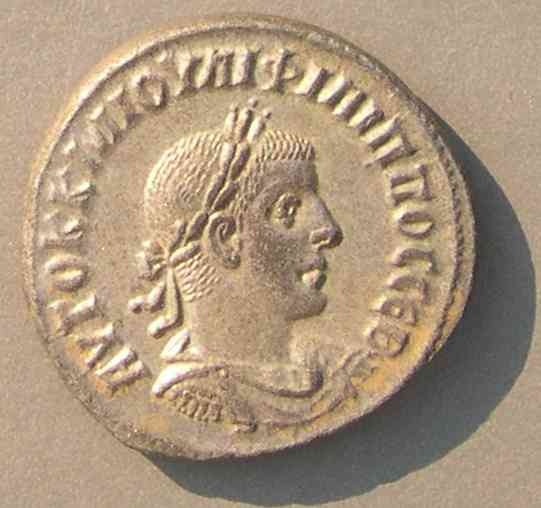 The reformed half-follis had the city-name abbreviated even more. this denomination and only this year. The above 20-nummia type and the following 40-nummia type, both of year 13, 539/40, were not issued in years 14 and 15 because of the interruption of the invasion of Khusru I mentioned above. 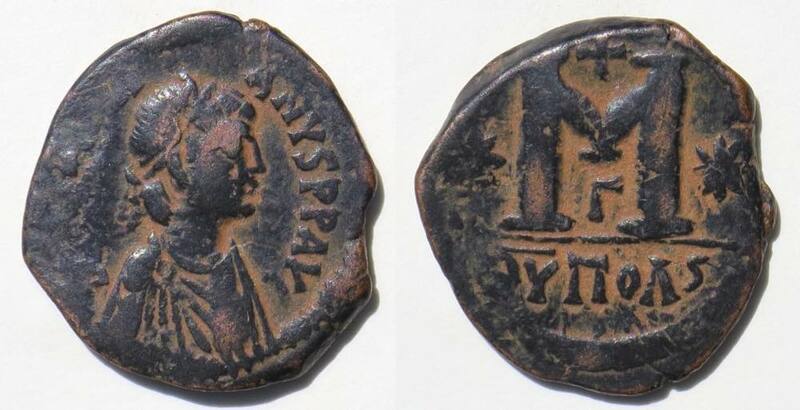 They were also not issued in years 17, 18, or 19, but the reason for the second interruption is not certain [Grierson, Byzantine Coins, page 66]; Hahn suggests it may have been the plague [p. 62]. CHEUPo, bar over the CH. 39-37 mm. 22.53 grams. 6:00. Year XG = 16 = 542/3. Mintmark: CHEUPo, bar over the CH. This mintmark is only from year 16 and no coins with years 17, 18 or 19 were minted, for reasons uncertain, but possibly because of the plague. 38-37 mm. 16.81 grams. 6:00. The metal of this piece is unusual and granular. The explanation for the fabric is not certain. It could be either an ancient or modern imitation. 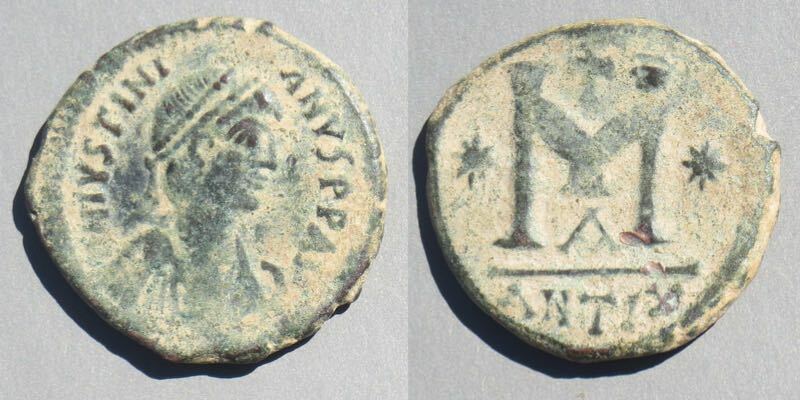 Another possibility, which I believe, is that the tribulations of the mint forced them to use an irregular metal source. 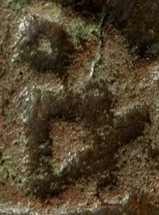 The narrow "X" in the date is also seen on the DO and Hahn specimens from officina Gamma. On this issue the M is wide (leaving less room for the date) and the diagonal strokes of the M do not go to the top of the vertical strokes. 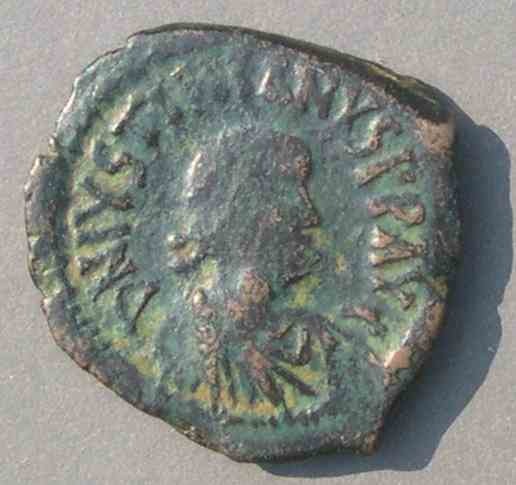 Minting Resumes in Year 20 with a new Mintmark. That mintmark appears on decanummia too. 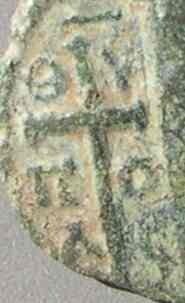 continues downward and must have been a local version of T.
The final letter is a Π with a slash abbreviating "polis". That odd first "letter" is not an error; it appears on all issues of the M and I denominations dated from years 20 to 24. For the K denomination, see the next coin. Some half-folles just indicated the "polis" part which apparently was deemed sufficient. 27 mm. 9.41 grams. 10:30. Mintmark: Π with a slash and o above. This is an abbreviation of "polis". This mintmark was used only on this denomination and only years 20-29. The obverse is struck with a decanummia-sized die, too small for the flan, unlike the next example where the obverse die is too large for the flan. Π with a slash and o above. A rho-like symbol was another abbreviation for "polis". this denomination and only years 30-34. Years 25-38 have the first symbol more like a T.
39-34 mm. Remarkably large flan. 17.84 grams. 6:00. This mintmark (sometimes without the terminal *) has been found from years 28 and 30-34. The flan is far larger than the beading, making the coin unusually large for this late date. The DO examples for this year are only 34mm and 32 mm. From year 35 an E is inserted into the mintmark. THEUP [The "T" is so curved it is almost like a C with a T top. on the M and I denominations. 16-15 mm. 2.30 grams. 12:00. Epsilon with the middle stroke expanded to a monogram of "IVSTINIANVS"
Sear 245, a second example. The End (except for references below). Return to the list illustrating the mintmarks. Go to the main Table of Contents page on Ancient Greek and Roman Coins.